Why do poets stand up in public to read or recite their work? Is it for applause? Did their publishers say it's the only way to sell books? Why did Gertrude Stein set so many rules about her public speaking engagements during her 1934-1935 lecture tour in America? The Steiny Road Poet has been thinking about these questions following the launch of her new collection of poetry—On a Bed of Gardenias: Jane & Paul Bowles. Since Leap Day 2012, the S.R. Poet has had the following experiences—a reading in a funky Chicago storefront "listening space" with three other poets in an offsite Associated Writing Programs (AWP) Convention listed event, a book signing at her publisher's AWP Bookfair booth, five-minutes at a bar in a poetry and storytelling marathon open mic, and a performance with another poet at a private party that included a short piano concert. Each of these stand-up opportunities defined its own standards for success. Over the years, the Poet has learned that the delivery of the poetic line is not appraised by applause or book sales, but by an active quiet in the room—attentive listening followed by two-way conversation after the performance. Gertrude Stein called this talking and listening. The result of talking and listening in the Steiny Road Poet's mind should be an exchange of knowledge so that both parties learn something. At Brown Rice, the funky Chicago listening space, the Poet collaborated with Chicago poets Charlie Newman and Dan Godston and with New York state poet Margo Stever. Try as she did, the performance plan she sketched for the evening was not totally embraced by all the participants. What she wanted was to have each of the four poets give an opening poem followed by individual readings up to as much as 15 minutes with some improvisational interaction with the experimentalist poet-musician Dan Godston and then a closing poem by each poet. It got a little surreal when Dan disappeared, missing his opportunity to deliver an opening poem but no matter, the show went on. The Steiny Road Poet was pleased to hear the familiar work of Margo Stever (Margo Stever and Karren Alenier have been studying each other's work and offering editorial comment on the other's work prior to recent publication by both) and the completely unknown "burned grammar" of Charlie Newman. Yes, it turned out that Charlie is working in a way that parallels techniques employed by Gertrude Stein. When it was the Steiny Road Poet's turn to take the floor, she saw right away that she had some extraordinary listeners in the audience, making the experience worth the risk and trouble of making the evening happen. More or less there was a total head count of fifteen people that was quite respectable given the fact there were 30-some other literary events that evening vying for AWP audience and there were about half a dozen unknown badge-wearing AWP registrants who showed up at brown rice, which was not so easy to get to from downtown Chicago where the AWP conference hotels sat. And eventually Dan who had been in a sound booth recording the event appeared to interact musically with Charlie and Margo. Jean Cocteau would have been at home with the drawf-sized trombone and the deconstructed piano with exposed harp that Dan played, not to mention the trumpet cupped by a ceramic bowl. Among the careful listeners of the audience, the Steiny Road Poet met and talked with Estelle Laughlin, whose Holocaust memoir of a girl who preserved goodness in spite of the evil that raged around her will be published this year by Texas Tech University Press, and poet Bill Yarrow, author of Pointed Sentences. Since the Steiny Road Poet's goal for this reading was to meet writers based in Chicago and to expand her AWP experience beyond the conference, the fact of not selling any books did not change how pleased she was by the outcome of the evening. The book signing was an event measured by book selling and therefore on the opposite end of the spectrum from the listening space reading. The Poet knew enough about the AWP Bookfair to schedule the signing on the second day and not the first. On the first day, the early arrivals were just getting their bearings and were not very interested in buying. In general though, folks passing by the too-numerous-to-count tables of books were leery of acquiring excessive weight which might cost them dearly when they got to the airport to go home. However, the Poet was genuinely blissed over the appearance of her book done with an intriguing cover design image printed on good paper so she wanted to show Sammy Greenspan, her Kattywompus Press publisher, productive appreciation. In an hour's time, she managed to encourage an equal mix of known and unknown people to buy the new book or her Greatest Hits book, also carried by Kattywompus. For the book signing, the Poet conjured her best street theater tactics giving passersby private readings and looking for ways to appeal to what mattered to these potential buyers. About eight books were sold this way. This style of interacting with audience is more about the author entertaining and charming her listeners than the more desirable talking and listening mode. In a way, the Poet was channeling the trance dancers she was introduced to in the company of Paul Bowles when she spent three weeks in Tangier, Morocco, working on her poetry and fiction. 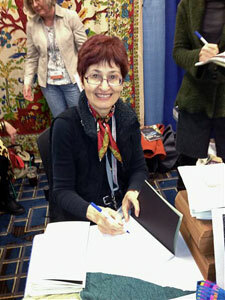 At the AWP Bookfair by working herself into an ecstatic state, she was able to bring others along who wanted to share the author's experience. The marathon reading in a dark bar was a long shot in the Steiny Road Poet's plan to meet other Chicago poets. Larry O'Dean, the generous organizer of this event urged Margo Stever and Karren Alenier to eat dinner at the family-owned agro-conscious Browntrout restaurant next door before going to the Horseshoe bar. What a fantastic meal and the Poet without half trying sold a book to the owners of the restaurant. Maybe this is where the evening should have ended. However, the two out-of-town poets went to the marathon already in progress, found a table, signed up, and heard many outrageous poems and stories. What to do? No way to meet these writers to find out if what they read was typical of their work or only what they whipped out for a bar crowd. So the Poet handed out Word Works brochures from the literary organization she has been working with for decades in the hope that cross-pollination might occur. Still when it was her turn to talk into the mic, she saw she got the attention of the late night crowd, most of whom knew each other (apparent by the clapping when the next writer's name was announced). However, a five-minute reading in a dark place is like hollering down a well. This is the sort of reading experience that makes a poet wonder whether she is making a fool of herself. This was what made Gertrude Stein set a strict set of rules about her public speaking presentations during her American lecture tour. But a reading marathon, however good it is for the local community, is the reading experience making a writer question why she stands up in public in a place where no one is likely to remember her name or face and no one makes an attempt to talk to the interloping writer. and Karren Alenier along with pianist Carl Banner assembled before an audience of twenty comfortably seated listeners in an intimate room with excellent acoustics and a bounty of visually engaging works of art. 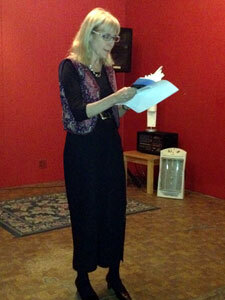 The poets offered introductory poems followed by a short run of Robert Schumann compositions. Then the main readings with more Schumann between to give breathing space, a reprise of Schumann's "The Poet Speaks," followed by the two poets reading improvisationally together one of Margo Berdeshevsky's poems that seems to demand more than one voice. When the Steiny Road Poet spoke to her poetry collaboration partner a couple of days later about the event where many books by both artists were purchased and signed, they each had had this hyper-awareness of having opened up communication with the audience in that silent pause after a poem ends. It's one of those experiences that wakes up the artist's senses and makes her say, this is why I read my poetry aloud; now I can learn something, now I can create something new. 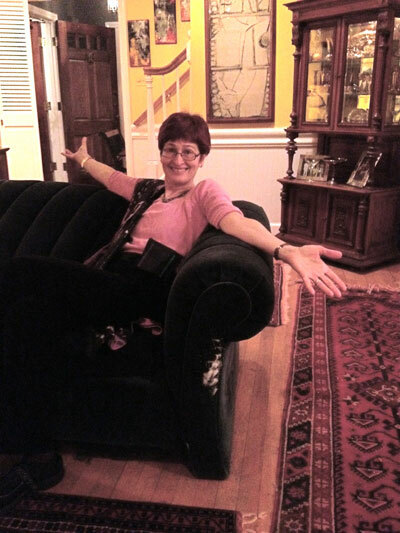 Karren LaLonde Alenier is the author of five collections of poetry and, recently, The Steiny Road to Operadom: The Making of American Operas and she is a Senior Writer and Columnist for Scene4.